Despite the objection of opposition parties, the Turkish Parliament has approved two military cooperation deals with Qatar in an apparent show of support for the Gulf country in its feud with Saudi Arabia and other regional nations. Legislators in the ruling party-dominated parliament on Wednesday approved allowing the deployment of Turkish troops to a Turkish base in Qatar as well as a deal for the training of gendarmerie force personnel. The legislation was moved up parliament’s agenda and rushed through the assembly a day after Turkish President Recep Tayyip Erdogan voiced support for Qatar in the feud and criticized other Gulf countries' moves to isolate Doha. Turkey and Qatar have developed close ties over the years and reached agreement in 2014 to set up a Turkish military base in the tiny Gulf nation. Government officials said Wednesday the military would decide on the number of Turkish troops that would be deployed in Qatar and the length of their stay. Previously, officials had said as many as 3,000 soldiers could be sent. 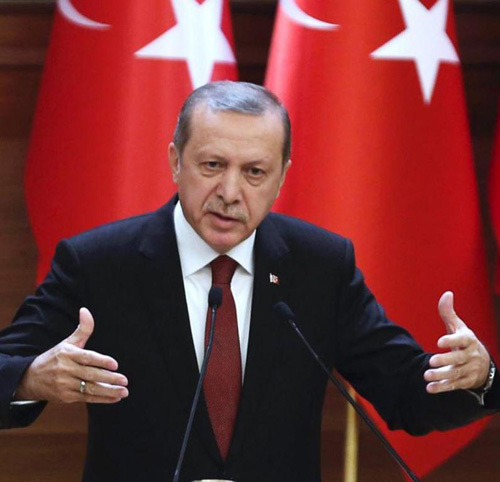 Meanwhile, the Emir of Kuwait Sheikh Sabah Al-Ahmed Al-Jaber Al-Sabah received Wednesday a telephone call from Turkish President Recep Tayyip Erdogan. Kuwait’s Emir arrived in Doha on Wednesday and was received by Qatar’s Emir Sheikh Tamim bin Hamad Al-Thani. Earlier in the day, Sheikh Sabah held talks with Emirati leaders, after meeting on Tuesday with Saudi King Salman in Jeddah over the crisis facing the six-nation Gulf Cooperation Council (GCC). Saudi Arabia and allies including the UAE, Bahrain and Egypt on Monday cut diplomatic ties with fellow GCC state Qatar over claims Doha supports extremism. The Saudi-led alliance also imposed economic blockade over the small gas-rich state which included cutting off the only land exit for Qatar. They called on Qatar to change its policies and to halt its alleged support to extremist groups including the Muslim Brotherhood and the Palestinian Hamas movement. Kuwait, also a GCC member, did not join its neighbors in severing ties with Qatar. The Kuwaiti Emir played a pivotal role in mediating a compromise in a 2014 diplomatic dispute between Saudi Arabia, Qatar and other Gulf states.